Welcome back to Tada's!! I told you that we had some fun, new, exciting things going on around here. Have you noticed the sweet web design my niece and sister did! AMAZING! I love the sparkles! We are also switching things up a bit this year and adding in more than just food. We're adding in crafts, furniture redo's, activities to do with your kids, maybe a few birthday party ideas here and there. It is going to be such a fun year! So much is happening!! So stay tuned for more every week! If you have questions about anything feel free to comment or e-mail. And if you love our stuff we have added new pin it buttons on the bottom of every post to make it easier to share! It even works on my phone now and we used to have a big problem with even viewing our page with cell phones, ugh!~ So glad it's all better now! We tried different bedrooms but as we had kids the boxes got moved around and around and some how ended up in our closet! Yuck!! Seriously every time we scooped, the dust would go flying and I felt like I smelt like kitty litter ALL-THE-TIME. I didn't, but I felt like I did. We also tried different boxes to see what looked nicer, some with lids, some with out, big, small, etc.... Finally we settled on this bright orange tote that we cut a hole out of, and put it in an empty spot in our all way(my father in laws brilliant idea! 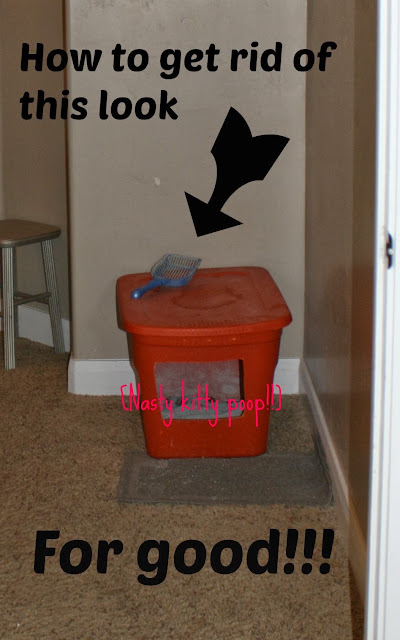 It's way cheaper and nicer than store bought litter boxes). It has actually been so nice, it holds a lot of litter, keeps the dust down, is big enough to keep the litter in when the cats kick it around but every time I walked down the hall to my room I saw this..
Do I scoured through Pinterest and all over Google to find what might work and came up with some great ideas. So I spent months and months trying to find that perfect piece of furniture that would fit nicely into that space. I could not for the life of me find any dressers that would work but I kept searching. One day I happened to see a cute little hutch on a local yard sale sight on Facebook and I knew that it was the one. We emailed about the dimensions and price and my husband picked it up the next day! I started by painting the back splash, if you will, Lucky Shamrock- GLG05 by gliddon that I had put into a satin painter/primer by BEHR, that I bought from Home Depot, for my twins super hero room a year ago and had some left over... I totally spaced taking a complete before picture but here it is after 1 coat of the green. After my first coat I brilliantly thought, 'Oh while It's drying I'll do the polka dots on the back splash'. Duh!~ Big Mistake!! Drips everywhere!!!! So I waited patiently for it all to dry and did a second coat with my little helper. ( We could have painted the whole inside but I chose not to on this project because it really will only be ever used for kitty litter and I don't care too much about what the inside looks like).. We used the color Distant White E46- in semi gloss by Benjamin Moore that I bought at my local Ace Hardware Store. Finally after the 2nd coat and 3rd coat in some areas dried my husband tipped it on it's back, I repainted the green and redid the polka Dots. I painted with a foam roller (not the one in the picture above) and to do the dots I just took it off the roller and dipped the end into the paint and it was the perfect polka dot size! Don't mind my cat Ted, He just cant get over this thing! and neither can I! Inside we laid down a kitty rug, It is sold by the kitty litter and boxes, they are specifically made to hold any litter that may have fallen over the edge and as I vacuum everyday I open the cupboard and run my wand over the carpet and it keeps it neat and tidy in there. We also measured the inside of the cupboard and bought a litter box that would fit. I lined the drawer and we now store the scoop and since this picture I have also put in the kitty brush and random cat accessories to keep them out of other parts of the house and stored nicely in one spot. This hutch also fixed another problem I had in my home... Where to put my diaper bag. I used to hang out on random counter tops or on the door nob in my tiny laundry room swinging around and taking up space as we try to maneuver ourselves in from the garage and into the house. I hope this gives you some fun ideas!! And stayed tuned, next week I will show you what I use to tie back the curtains in the nursery..